My Wine of the Month for February is Bellevue Estate P K Morkel Pinotage 2010. 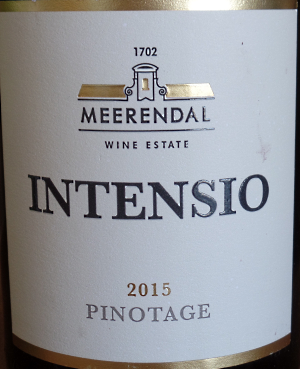 After spending a month in the Cape wine lands and drinking excellent Pinotage everyday to choose just one was a difficult choice. But most of the time wines were the most recently released vintage and while enjoyable, and in many cases immensely enjoyable, they would be even better with a few more year’s bottle age. 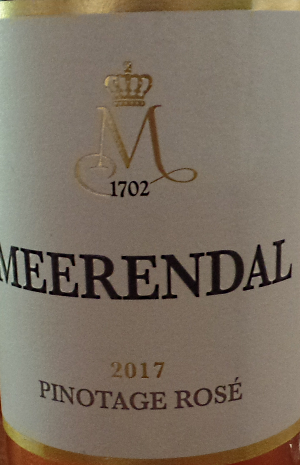 This wine, currently on sale in Bellevue’s tasting room at R225, is at its peak eight years after vintage. It’s just bursting with voluptuous fruit and has a gorgeous big spiciness with soft tannins on the finish. It was a really enjoyable and memorable wine. This Pinotage honours Pieter Krige (P K) Morkel, a famous Springbok rugby player, who converted his farm to a wine estate. 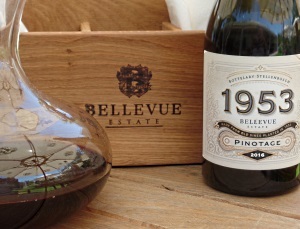 In 1953 he went out to buy Gamay vines and came back with the new Pinotage variety. To Bellevue Estate for lunch. When I'd called there the previous week I was unable to buy a bottle of their new single-vineyard wine from the old block as it is available only from the restaurant. It's all change at Bellevue. 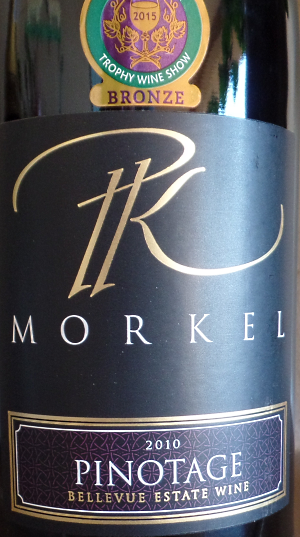 The Morkels, whose family have owned and farmed the estate for four generations sold it to a German man last year. He has already made several adjustments, including the single-vineyard bottling and a restaurant with its own brick pizza oven. 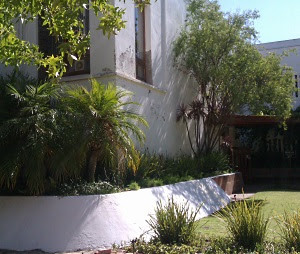 Seating for the restaurant is both inside, at the rear of the tasting room, or outside under large umbrellas on a lawn. There are mostly huge tables, but our waitron found us a small one and moved it so we were shaded. We had the place pretty much to ourselves,though it seems it's packed at weekends. I hope so. 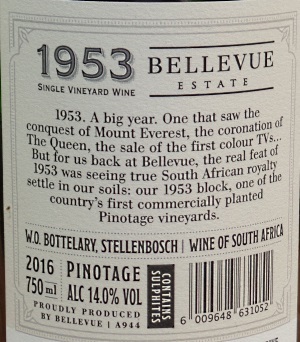 Bellevue always seems to have been under-appreciated though it makes first rate Pinotage and were among the first to bottle single varietal Malbec and Petite Verdot. 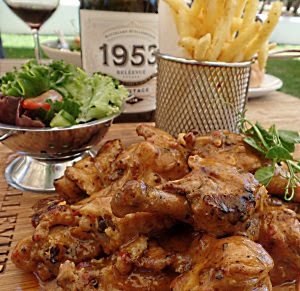 A generous mound of tasty tangy wings, salad and chips go great with Pinotage. There's a small and interesting menu as well as pizzas. I was tempted by whole baby chicken in a lemon sauce but ordered spicy chicken wings. These came on a wooden platter in a generous mound, well coated in a spicy and flavoursome sauce accompanied by skinny chips and a small salad. Skinny chips came in an individual small 'frying basket' and the salad in a tiny colander. This may have looked good in the restaurant supplies catalogue, but practically it makes no sense as the salad dressing was coming through the colander's holes forming a pool on the wooden paddle. The wings were very tasty and moreish and what looked too much when delivered soon was finished. What to drink? I was going to take home a bottle of the single-vineyard wine and decided to have another with the meal. Our attentive waitron diplomatically rested his finger on wine list pointing to its price (R545) asking if this was the wine I wanted. 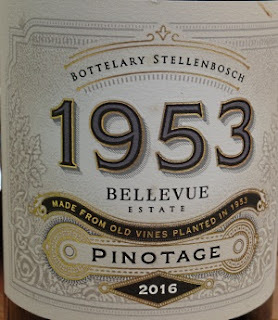 When he showed me the wine, which is named 1953 after the year the Pinotage vineyard was planted, he made a point of explaining that the wine was from the 2016 vintage. After making sure I understood he offered to decant the wine because of its youth. The wine was young, but there was good fruit, a tautness about the wine, and the promise of greater things to come with a bit more bottle age. 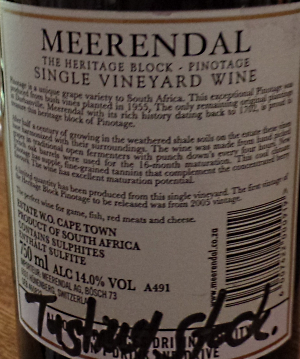 Many years ago, I'd asked Dirkie Morkel why he didn't bottle the old vineyard separately. He'd said he always wanted to make the very best wine and that sometimes the other vineyards out performed the 1953 block. 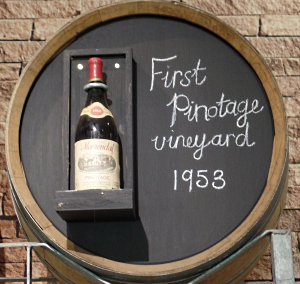 The wine is called 1953 after the year PK Morkel planted 2.58 hectares of Pinotage. The following year PK added another 3.23 hectares. 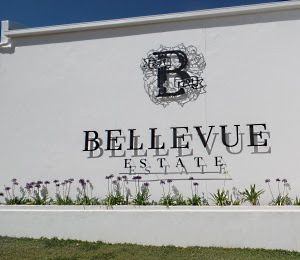 In those days wines made at Bellevue were sold to Stellenbosch Farmers Winery. It was in 1961 SFW released Bellevue's 1959 vintage Pinotage under their Lanzerac brand, and the rest is, as they say, history. And history celebrated by a stamp issued last year by the South African Post Office with a photo of that first Pinotage. A neck label stated that there were only 600 bottles of this wine. That equates to two 225 litre barriques, so I assume 1953 is a selection of the two best barrels made from the old vineyard. 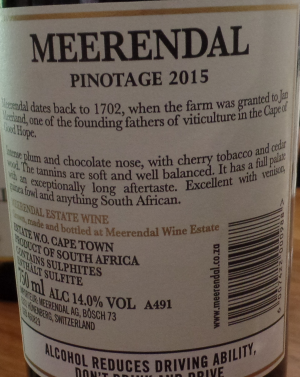 The previous week I'd taken away a bottle of P K Morkel 2010 Pinotage and it was one of the best I'd drunk so far on this visit. Now eight years old with an attractive cedar wood nose, beautifully spicy fruit, soft tannins and lovely Pinotage sweetness. I must keep 1953 to let it develop. 1953 comes in a big heavy thick bottle with a hugely deep punt and wax seal. It's a statement bottle, but irritatingly too wide to fit in a polystyrene packer so to get it home I'm going to have to wrap it in clothes in my suitcase. To Kanonkop with Eleanor Cosman of Toronto's South African Wine Society. It's vintage and a critical time to judge exactly when grapes should be picked. Cellarmaster Abrie Beeslaar is out in the vineyards making those tough decisions and asked his assistant Alet De Wet who is managing the winery today to show us around. 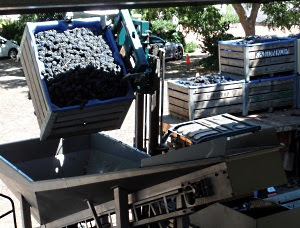 The first Pinotage is arriving from contracted farms in bins on the back of lorries. Alet tells us that there are 30 growers in Stellenbosch from whom Kanonkop buy grapes. Today's grapes are coming from three of those farms. Bought in grapes are for the Kadette range, both varietal Pinotage and the Cape Blend. For the flagship Estate wines, production is limited to what can be grown on the Esate. 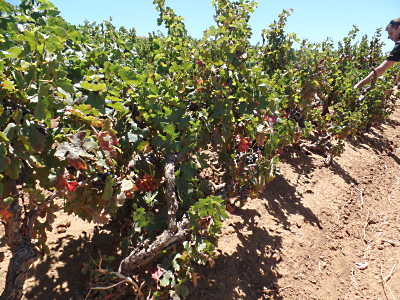 Kanonkop have one of the world's oldest Pinotage vineyards and at over 60 years the old bushvines are producing less each year. The Kadette label was originally used for wine from young vines and barrels that didn't meet the Estate standards. But demand for the keenly priced Kadette range keeps expanding and is now met by buying in grapes from neighbouring farms. 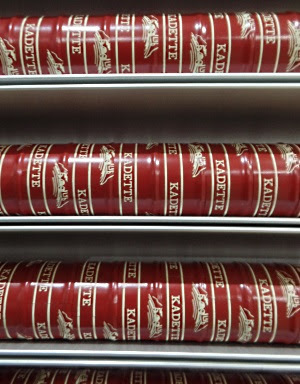 Co-owner Johan Kriger told me that orders for Kadette is fast increasing. Currently around 2,000 tons of grapes are sourced for Kadette and the estate grows around 500 tons. The bins are unloaded from the lorries by a forklift truck which then upends each one in turn into the bin of a destalking machine. The grape bunches look glowing with health and vitality and taste sweet, even though the Cape is going through the third year of the severest drought in memory. But many of these grapes will end up as compost because they do not meet Kanonkop's exacting quality standards. 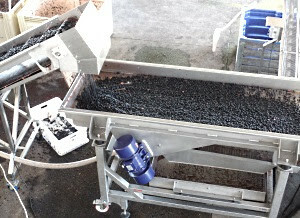 After de-stalking the grapes empty onto a perforated shaking sorting table. 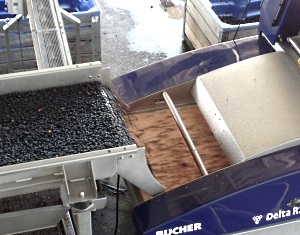 Grapes which are too small, not developed or unformed plus twigs and other MOG (material other than grapes) fall through the holes to the reject bin. 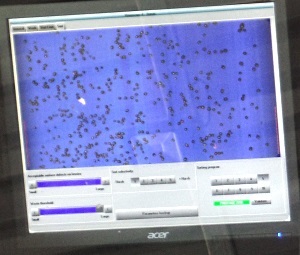 Those that pass the sorting table cascade onto the fast moving belt of the optical sorter. 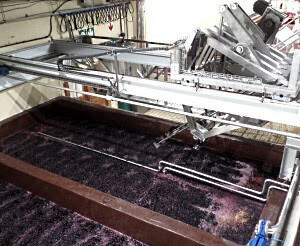 This mega-expensive machine, one of only three such machines in South Africa, can handle 20 tons per hour and compares each grape against a template defining acceptable colour, size and whatever is programmed into its memory. Only those berries which pass this hypercritical individual examination make it through. There's a large bin full of berries that look good to me, but these are the rejects. At some wineries these will in turn go through a second pass of the sorter reset to lower standards for use in a second or third label wines. But not at Kanonkop. The next stop for these rejects is a compost heap. The berries that make it through the two selections are pumped directly into the open fermentation tanks, known in the Cape as kuipes. Alet informs us that each kuipe can hold between 8 and 10 tons of grapes, which would produce around 10,000 litres of wine. 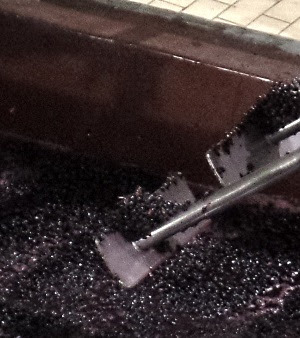 Pinotage is inoculated with yeast and fermentation takes around three days kept at at 28C by means of chilled water being pumped through a radiator in each kuipe. The layer of grape skins pushed up to the surface by CO2 produced during fermentation is punched down every two hours around the clock so colour and flavour can be extracted from the skins. 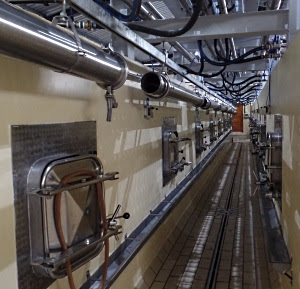 To increase production of Kadette wines a new section of kuipes has been built, and because there are now too many kuipe for the punch-down teams to handle, robots move on tracks over Kadette's kuipes, lifting and pushing down steel plates at the end of poles. 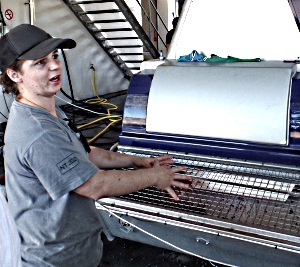 Abrie Beeslaar got the idea after visiting Portugal's Douro Valley where some Port houses have introduced machines for treading grapes. Abrie got a South African company to manufacture a machine to his specifications. “It uses the same pressure as if done manually,” Alet told me. 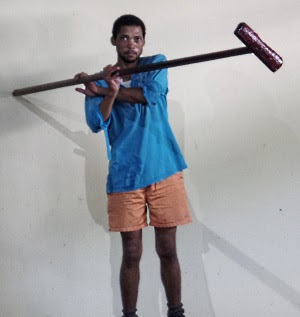 Estate wines continue to have their cap pushed down manually by staff balanced on planks over the kuipie wielding what looks like a broom without bristles on a long handle. I've done this myself at Kanonkop, albeit for a very short time, and found it exhausting back breaking work. 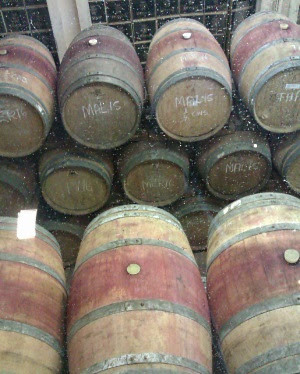 After fermentation is complete, Kanonkop's wines are put in barrel. All new for Estate wines, older wood for Kadette. “We buy 400 new French oak barrels each year, costing around 700 Euros each,” said Alet. As well as Kadette Pinotage, Kanonkop produce an Estate and a premium Black Label Pinotage. Kanonkop's range of seven wines are the pale pink Kadette Pinotage Rose, Kadette Pinotage and Kadette Cape Blend (Pinotage, Cabernet Sauvignon, Cabernet Franc and Merlot. 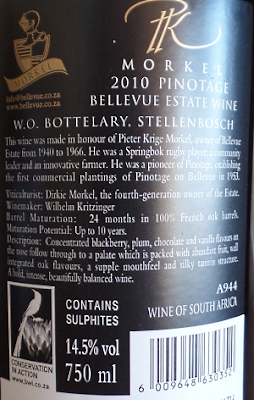 Estate wines are Pinotage, Cabernet Sauvignon, Paul Sauer (a blend of Cabernet Sauvignon, Cabernet Franc and Merlot) and the Black Label Pinotage. Many thanks to Alet de Wet for taking time during harvest to show us around. James Lawrence, writing for WineSearcher.com is another Pinotage hater who has found now some that "challenged all my bigotry about the grape." 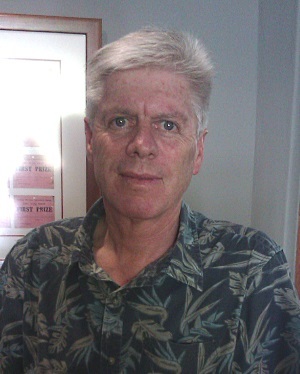 Sam Venter, for the Port Elizabeth Herald, tasted the winners of the 2017 Pinotage Top 10. 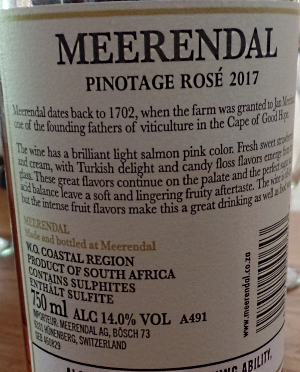 I’d challenge any Pinotage- doubter not to find a wine to love in the selection of 2017 winners, tasted late last year when Absa brought the 10 champions and their makers to Port Elizabeth for the first time in many years – and hopefully not the last. It was a rare treat to taste and compare side-by-side how 10 different estates put their own stamp on the same cultivar, especially when each of the wines is considered a “best of the best”. 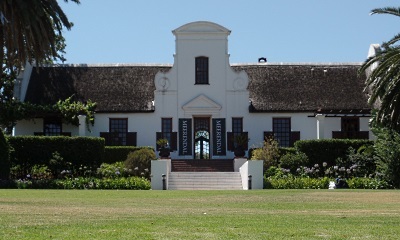 To Durbanville, a pretty rural hilly region north of and close to Cape Town, known for its stunning hill grown cool-climate Sauvignon Blanc and classy Pinotage. 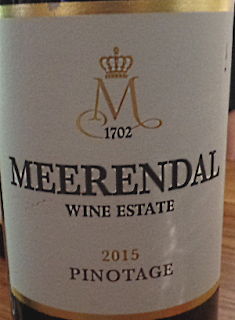 Meerendal Estate has the third oldest Pinotage vineyard in the Cape – and thus the world. 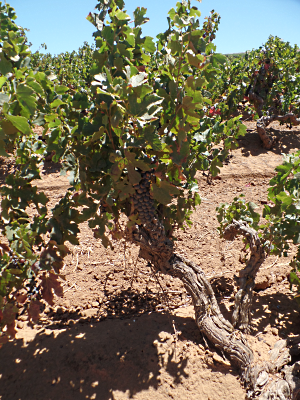 These six hectares of gnarled bush vines growing on red clay were planted in 1955. 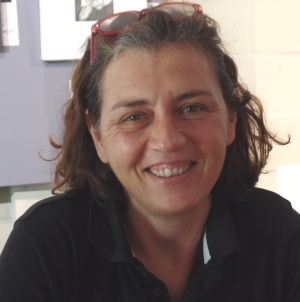 I went to meet winemaker and viticulturist Liza Goodwin and Benny Howard CWM, to update myself on what's been happening since I visited ten years ago, to taste current offerings and to visit the old Pinotage block. There have been a lot of changes, and I found the tasting room behind the new Carlucci's coffee shop and deli. The tasting room walls were covered in paintings from an artist who will be designing a new Meerendal label. 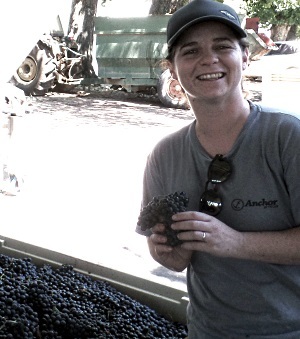 Liza Goodwin has been Meerendal's winemaker since 1998 so she has a detailed in-depth knowledge of the Estate's terroir and cultivars, but she is not stuck in the past and is working with new wines and experimental bottlings. This was an attractive wine, dry yet full bodied enough to give an impression of sweetness. Closed with a screw cap. And there is great fruit, raspberries and strawberries, in an elegant wine showing its pinot heritage. This came from the old dry-farmed bush vine block planted in 1955. The previous vintage release was 2010. 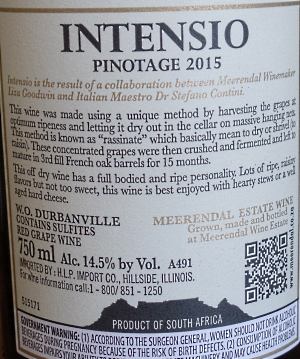 Liza said that there wasn't enough local demand for the prestige single block bottling every year so from 2011 to 2014 its fruit had gone into the standard bottling. This had been aged for 24 months in all new small French oak barrels, and bottled in June 2017. “The berries were very small and the fruit is strong enough to carry the wood,” said Liza. The wine had just been opened and was very tight . “It should be decanted an hour before drinking,” said Lisa. She expected the optimum drinking time to start in 2020 though it would be good drinking for many years afterwards. I could taste the power of restrained fruit waiting for time to reveal them and it rewarded with a long lingering finish. 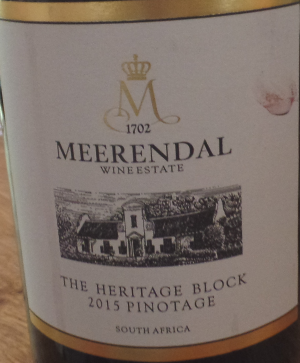 This is definitely a wine that would pay keeping, whereas the 'standard' Pinotage from the large trellised block will, without doubt, age and develop, it was much more ready to drink now. The Rosé is made for the German market, where such is its popularity 35,000 bottles are sent annually. 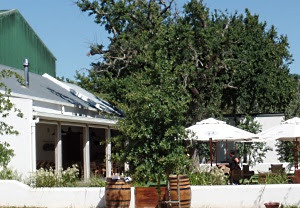 The wine is not distributed locally, though 5,000 bottles are sold in Meerendal's two restaurants. The fruit comes from outside the estate. Chilled, the attractively coloured pale wine is a real crowd pleaser with its sweetness and fresh fruity-gum flavours. A heavy statement deep-punted bottle with wax capsule holds this Amarone style wine. 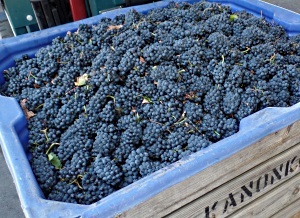 One third of bunches are harvested at 25 brix to hang in nets in the cellar until they dry out to 30 brix. The remaining two-thirds of bunches have their stems twisted at 24 brix so the berries dry on the vine and are harvested when they reach 30 brix. “The grapes on the vine dry much faster than those in the nets,” said Liza. Then they are separately fermented before being blended together. The raisining of the grapes leaves 6gl residual sugar. This was a dense and luscious wine that over time opened out even more and grew more silky and richer with lots of dense black plum fruit flavours. I loved this. Yes, 23 years old and yet sprightly. There is a slight browning on the rim and a whiff of age that soon clears. Then an upfront sweetness on the palate. It was deliciously soft and ripe with a beautiful spiciness. 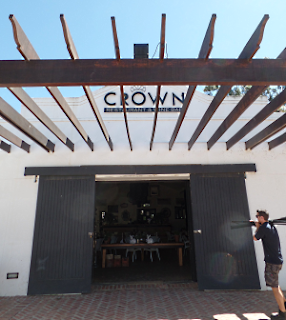 New at Meerendal is a distillery from which Liza brought a sample drawn from cask of a golden brandy. “2017 is the first year we've made brandy from Pinotage,” she said. “It's a trial. I've added water to this to bring it down to about 43% abv.” It smelled powerfully alcoholic and was a work in progress. I wanted to visit the old Pinotage block and Estate Manager Matt Zoutendyk kindly drove Liza and me there in his farm bakkie. 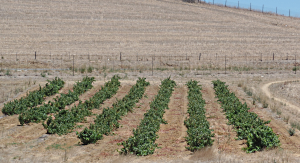 350 Pinotage bush vines planted for the Cape's 350th anniversary of wine making. The old block is planted on red clay on a high slope that gets strong breezes from the Atlantic ocean, visible over the crest. The vine trunks are thick, gnarled and grey, their leaves vivid green against the red soil and deep clear blue sky. To my eyes there are impressively large bunches of purple grapes, but Liza is not so happy. “We have some millerandage because of strong winds at flowering time,” she remarks. Millerandage, where flowers are not fertilised, results in small seedless berries. She dives through some leaves and lifts a bunch in the palm of her hand. “See how there's uneven ripening.” She points to some green and pale red berries among the tightly bunched purple berries. “And these ones...” She picks a berry from a vine at the end of a row that has lost its leaves and chews on it. “It's raisined.” These berries are drying, their skin wrinkled. The vineyard will need to be picked carefully and the berries sorted and selected. 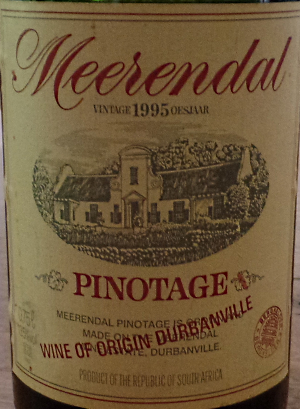 The Heritage Block, 6 ha planted in 1955, was Meerendals third Pinotage planting. The first two vineyards, planted in 1953 and 1954 became diseased were removed some time ago. It is a pleasure to stand here surrounded by old vines, the warmth of the bright sun in a clear sky refreshed by cool breezes. Matt drives us a short way up the hill past more recent trellised vineyards 'till we can see the sea, and then we head back down to the winery complex to lunch in Meerendal's Crown Restaurant. Bennie has brought the opened 1995 Pinotage from the tasting room which pairs beautifully with my 'Gourmet Burger' with scrumptious hand-cut fried potato wedges. 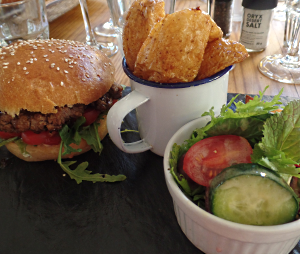 Lovely generously meaty burger taste homemade and crisp large wedges make a perfect Pinotage match. Have I found wine lands best burger? Meerendal combine history and tradition with forward thinking and transition. I mustn't leave it so long before I return. I can't wait to see what they do next. I am most impressed by their Wine Academy which gives anyone, for a modest fee, the opportunity to spend a week in Meerendal's vineyard and winery at vintage time covering all aspect of wine making under the care of cellar master Liza Goodwin combined with classroom tuition and tastings by Cape Wine Master Bennie Howard to gain the coveted industry qualification, the Cape Wine Academy certificate. Many thanks to Liza Goodwin, Bennie Howard and to European Sales Manager Siobhan Hughes for arranging my visit.